Valentine’s Day brings out the best in everybody: Husbands, wives, fiancés, boyfriends and girlfriends. On Valentine’s Day we all shower those that we love with gifts: flowers, chocolates and so on. On Valentine’s Day we all put our best foot forward and do our very best at showing the people we love, that we love them. On Valentine’s Day we live and love the way that we’re supposed to all year round. I’m not going to put anybody on the spot, but guys, when was the last time you brought your wife or girlfriend a dozen roses or a box of chocolates, just because? Wives, when was the last time you made a special dinner or breakfast in bed for your husband? You see, we’re supposed to show our love, not just one day a year but consistently, year round. As my grandmother used to say, “The proof is in the pudding”. How do you show your love on a consistent basis? So often we love like that little girl loved broccoli: We love in theory, but when it comes right down to it, we maintain a safe distance – we don’t want to lose our macho and get all mushy. In the words of the Apostle John, in 1 John 3:18, we love in word, but not in deed and truth. You see, the proof of our love is in the pudding – the proof is manifested in our actions. What does your love look like? What does biblical love look like? We know that our relationships in the family need to be marked by love. Husbands, are to love their wives. But, wives, too, must love their husbands. Parents and children, brothers and sisters, must love one another. But how do we know what such a love looks like in everyday attire? detailed description in the Word of God that tells us what love looks like? If you have your Bibles please turn to 1 Corinthians, chapter 13. In this, Paul’s chapter devoted entirely to to love, God gives us a detailed look at what love is to look like in our daily lives. The chapter starts out by telling us that of all the gifts: tongues, prophecy, faith, charity and sacrifice – if we have all these but don’t use them based on love, we have nothing. 2 If I have the gift of prophecy, and know all mysteries and all knowledge; and if I have all faith, so as to move mountains, but do not have love, I am nothing. We can pray in tongues and prophecy til we’re blue in the face, but if we don’t speak on the foundation of love, it will fall on deaf ears. Likewise, if we have the faith to speak to any challenge and have it be gone, but don’t speak on the foundation of love, it means nothing. The back story to this chapter is that the Corinthian church was emphasizing spiritual gifts, to the neglect of the foundation of love. They were building their houses on sand rather than on the rock of Jesus. They were using their gifts apart from love. Paul makes the point that the use of their God-given gifts would amount to nothing if the Corinthians did not make love their priority. The message is clear: Whatever we do in the name of Jesus must be based in love for one another or it profits us nothing! 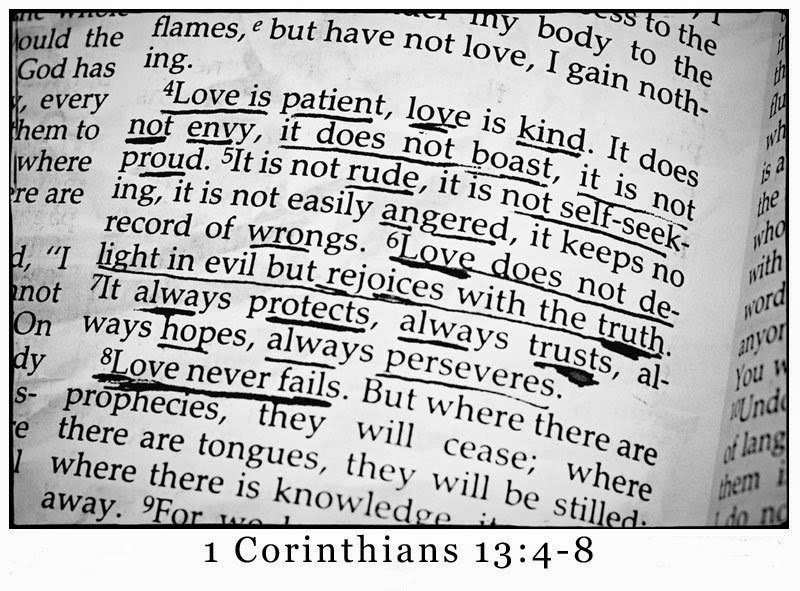 These verses are the most eloquent and profound words ever written on the subject of love. To comment on its parts is a bit like giving a botany lecture on a beautiful flower -- if you’re not careful you can lose sight of the beauty and impact of it. But we can profit from understanding the parts and applying it to ALL relationships. · In verses 1-3 he shows the preeminence of love, that love is the foundation for ALL spiritual gifts because without love, gifts are empty. · In verses 4-7 he shows the practice of love, how love is greater than all gifts because of its selfless characteristics. · In verses 8-13 he shows the permanence of love, that love is greater than all gifts because it outlasts them as the foundation on which they are built! When a house is destroyed by whatever means, what is usually the only thing left that is visible? The foundation! Why? Because it is the strongest part of the house! The foundation determines how high and wide any structure can be. Today we’re going to focus mainly on verses 4-7, where Paul describes how love looks and acts. In English most of these terms are predicate adjectives, I know because my mother was an English lit teacher - but in the Greek they are all verbs. This is important because Love is not talk; it is action! Love is all about walking the walk and not so much about talking the talk! You can say “Honey, I love you” but if in the back of her mind she’s thinking “What have you done for me lately?” you’re not doing the job right! We’re all prone to apply verses like these to others: “My husband and my kids could sure use a lesson in love. But me? I’m basically a loving person. I’m so easy to get along with.” But I ask each of you to forget about everybody else – stop playing the blame game and ask God to apply these verses to you in your life. Jesus Christ, in His sacrificial death on the cross, is the epitome and embodiment of this kind of love. Let’s look briefly at each of these characteristics of love. Why did he put that first? Because this often confronts Christians right up front with their failure in relating to their family or loved one(s). Patience is an interesting quality in that when we need it, we don’t want it. It’s when things start to irritate or frustrate us or even when we feel an urgency to communicate that we need patience, but usually at that point we don’t want to be patient! We want to throw caution to the wind and take action without thinking of the consequences. The Greek word for patience comes from two words meaning, “long-tempered.” If you’re patient, you’re slow to anger, you endure personal wrongs without retaliating. You bear with others’ imperfections, faults, and differences. You give them time to change, room to make mistakes without coming down on them. Parents, do you do that with your wife and children? Husbands, do you do this with your wives? Wives, with your husbands? Kindness is patience in action. The Greek word comes from a word meaning “useful.” A kind person is disposed to be helpful. He seeks out needs and looks for opportunities to meet those needs without repayment. He is tender and forgiving when wronged. The word suggests a person who is gentle, who has an ability to soothe hurt feelings, to help quietly in practical ways. Romans 2:4 tells us that the kindness of God leads us to repentance. Kindness motivates us toward positive change. As with patience, the real proving ground for kindness is in the home. Are you kind to your spouse and children? Do you do kind, useful things for them? Are you training your children to be kind to one another by the way you treat your spouse and them? Love is not macho; love is kind, giving and yielding. The word ‘jealous’ means to “eagerly desire” and it is used both positively and negatively in the Bible. Jealousy in the negative sense is related to greed and selfishness. The jealous person wants what others have, he wants things for himself. He is too self-centered to applaud others’ success; he has to be the center of attention. In the family, a jealous husband refuses to trust his wife. He doesn’t want to recognize her abilities and contributions. He is jealous of the time she spends with the children or with her friends. He wants it all for himself. James 4:2 tells us that jealousy is often the source of quarrels and conflicts. These ugly twins are related. They both stem from selfishness and are the flip side of jealousy. Jealousy is wanting what someone else has. Bragging is trying to make others jealous of what we have. Jealousy puts others down; bragging builds us up. Bragging is the outward manifestation of pride. The braggart tries to impress others of his great accomplishments in order to make himself look good: “After all I’ve done for you, and you treat me this way!” But love isn’t trying to build you up; love is trying to build up the other person. Love is humble. 1 Corinthians 4:7 tells us that the humble, loving person is aware that everything he has is an undeserved gift from God. So he doesn’t boast, but selflessly uses what God has given him to serve others. The Amplified translates this as, “Love is not rude, arrogant or inflated with pride” Love does not needlessly offend. Love has good manners. It is courteous, polite and sensitive to the feelings of others and always uses tact. The reason we are not courteous is that we are thinking only of ourselves and not of others. Men, this can be something as simple as opening the car door for your wife or or pulling our the chair and helping her get seated at the table. Common consideration and not taking her presence for granted is showing love to her. Love is not rude. Love does not demand its own rights. Don’t seek your own way or your own glory. Selfishness is the root problem of the human race; it is the antithesis of love, which is self-sacrificing. If husbands and wives, as well as children, would apply this verse our homes would be free of conflict and an honor to Jesus Christ, who did not come to be served, but to serve and to give His life as a ransom for many (Mark 10:45). The Greek word for ‘provoked’ means “to sharpen, stimulate or rouse to anger”. Love isn’t touchy. Love doesn’t have a hair-trigger temper. Some people make everyone around them walk on eggshells. They’re easily offended. One little thing that doesn’t go their way and “BAM!” They use their temper to intimidate and bully others. When you confront them, they say, “Sure, I have a bad temper. But I get it all out and it’s over in a few minutes.” Really? When you’re angry, you’re not loving. PERIOD! The word account here is used in numerical calculation. It is used of God not imputing our guilt to us, but instead imputing the righteousness of Christ to our account (Rom. 4:6-8). Love doesn’t keep a tally of wrongs and bear a grudge until every single one is paid for. It doesn’t try to gain the upper hand by reminding the other person of past wrongs. Love forgives! 10. & 11. Selfless love does not rejoice at injustice or unrighteousness, but rejoices when right and truth prevail. These qualities are the flip side of one another. To rejoice in the truth means to be glad about behavior in accordance with the truth of God’s Word. If someone you don’t like falls into sin, you don’t gloat; you grieve, because God is grieved over sin. If they repent, you rejoice. There is a fine balance to love. Although love is kind and overlooks the faults of others, it does not compromise the truth or take a soft view of sin! There’s way too much of this going on in the church today. To allow another person to go on in sin, to turn a blind eye, that’s not love. Love will sensitively confront and correct precisely because it cares deeply and knows that sin destroys. Love rejoices with the truth. Love gets excited when it hears of spiritual victories. Love encourages by expressing joy over little evidences of growth. John, the Apostle of love, wrote in 3 John 4, “I have no greater joy than this, to hear of my children walking in the truth” Rejoice in truth and shun unrighteousness. The word ‘bears’ here can mean either to bear up under or to protect by covering. If it has the first meaning, then it would be the same as “endures all things” in verse 7 of this chapter. Christ endured horrendous torture before being nailed to a cross to die one of the most painful of deaths – and never, not once, did He cry out. In the second meaning,‘to protect by covering’. Love doesn’t broadcast the problems of others. Love doesn’t belittle or point fingers. Love defends the character of the other person as much as possible within the limits of truth. Love won’t lie about weaknesses, but neither will it deliberately expose and emphasize them. Love protects. The Amplified translates, “Love is ever ready to believe the best about every person.” This does not mean gullibility; it does mean that love is not suspicious and doubting of another person’s character and motives without good reason, even if their actions have offended you in the past. If trust has been broken, then it needs to be earned again. But love believes the other person is innocent until proven guilty, not like our justice system that says innocent until proven guilty but really means guilty until proven innocent. If there is a problem, love doesn’t jump immediately to blame the other person – there’s no blame game with love. Just because something happens why do we always have to point fingers and find fault with somebody else? It’s our own sin nature that causes us to blame somebody – anybody but ourselves even if we know it was our fault. Love doesn’t play that game. Love is honest and owns up to the issue. In the family, trust shows itself by not grilling the other person about every detail of his story, like an attorney cross-examining a defendant. It means believing in your kids and your spouse and expressing confidence in them. When you trust someone it makes them want to live up to that trust. Sometimes you’ll get ripped off when you trust, but love persists in trusting. Love isn’t pessimistic. Love doesn’t expect the one who’s loved to fail, but to succeed. Love refuses to take failure as a final answer. It exudes a Godly optimism which says, “I know you can do it, because the Jesus in you is able!” Love doesn’t ignore reality, it doesn’t close its eyes to problems or bury it’s head in the sand. Love rests on the promises of God, that He is working all things together for good for those who love Him and are called according to His purpose. And so love is always optimistically hoping. The word “endures” is a military word meaning to sustain the assault of an enemy. It has the idea of holding up under fire. Love perseveres in spite of difficulties. Love hangs tough with a positive, triumphant spirit that sticks it out to the bitter end. This is why the original wedding vows said “til death do us part”! A symbol of the permanence of God’s covenant of marriage between a man and a woman - and only between a man and a woman! Love is selfless, wholly directed to build the other person up. If we substitute the name of “Jesus” for “love” in verses 4-7, we have a description of Him. Jesus is patient, kind, not jealous; does not brag, is not arrogant, isn’t rude; does not seek His own, is not provoked, does not take into account a wrong suffered, does not rejoice in unrighteousness, but rejoices with the truth; He always protects, always trusts, always hopes and always perseveres. You know, Love at first sight is easy to understand – but it’s only when two people have been looking at each other for years that it becomes a miracle. Miracles happen when we yield to God. Love happens when we get out of the way of ourselves and yield to God. Loving one another is the commandment of the Lord, and the observation of it alone is sufficient for us. But in order to manifest the fruit of the Spirit we have to get rid of the things that are hindering the fruit from blossoming – we have to kill the bugs that are eating away at our harvest. I want you to take special note of the phrase “the angel of the Lord”. This usage of “the angel of the Lord” is what is called a theophany. Theophany comes from the Greek word Τheophaneia, meaning ‘manifestation of God’. The angel of the Lord of the OT is the pre-incarnate Christ of the NT. Now substitute the word “love” for the word ‘fear’. “Jesus encamps around those who love Him, and rescues them” Hallelujah!